The Great power-grids of Egypt? At a site in the Western Desert, some 650 km south of Cairo, one of the world’s largest and most ambitious solar energy projects is underway. The Benban Solar Park will produce enough electricity to power one million homes. But more than that, it is part of a whole new strategy for infrastructure projects that will see the Egyptian government start to work closely with private enterprise. It is expected to go live in 2019, at which point it will house 32 power stations across a 37km2 site, and will be capable of generating 1,650 megawatts of electricity. This will go a long way toward Egypt hitting its goal of having 20% of its energy needs met by renewables. But the effect it will have on the economic fabric and policy-making strategies of the country are equally significant. Egypt is heavily reliant on fossil fuels and almost all the country’s power facilities have been built and owned by the government. The government also runs a series of costly fuel subsidy schemes, which add up to more than it spends on education, health care, and social welfare combined. The Benban project, however, is being created by a consortium of 13 private enterprises working in conjunction with the Egyptian public sector. 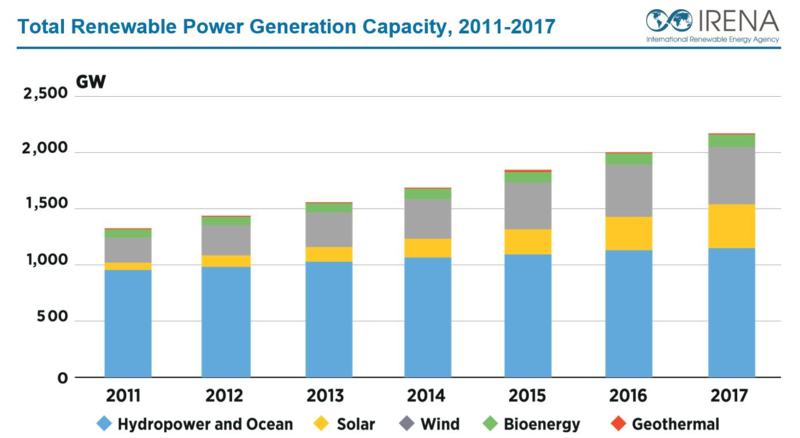 Global solar generation capacity has grown rapidly for seven years in a row. According to Dr Sahar Nasr, Minister of Investment and International Cooperation: “Egypt is moving forward with a very bold and ambitious economic reform program. One key pillar is promoting private sector participation. The World Bank has been one of the ongoing supporters of reforms to the Egyptian energy sector. It provided a $3 billion loan to help with that undertaking, as well as provide the framework and financing for the Benban project. Its International Finance Corporation (IFC) division, along with a consortium of other lenders, pledged $653 million and the Multilateral Investment and Guarantee Agency (MIGA), another part of the World Bank Group, is providing $210 million worth of “political risk insurance” to private lenders and investors. Interest in renewable energy is on the rise, with a number of very large solar parks either under construction or recently completed. Due to go live in 2023, the Ladakh solar farm in India is expected to produce 3,000 megawatts of electricity, which will make it the largest in the world in power generation terms. And at Yarrabee Park in the Australian state of New South Wales, plans have recently been rubber-stamped on the construction of a solar power project that will generate around 900 megawatts of electricity. Dubai is building what it claims will be the largest single-site solar power facility in the world. The Mohammed bin Rashid Al Maktoum Solar Park will have a planned capacity of 1,000 megawatts by 2020, and 5,000 megawatts by 2030. And within the next year, the $9 billion Noor complex in the Moroccan desert is expected to generate 580 megawatts – enough electricity to power over a million homes. Despite its undeniably sunny climate, solar isn’t the only renewable energy Egypt is investing in – it plans huge wind farms on the Red Sea and Gulf of Suez. And by 2026 it also hopes to have a new nuclear power plant operational. The 4,800 megawatt (MW) capacity plant at Dabaa is being built and financed by Russia.